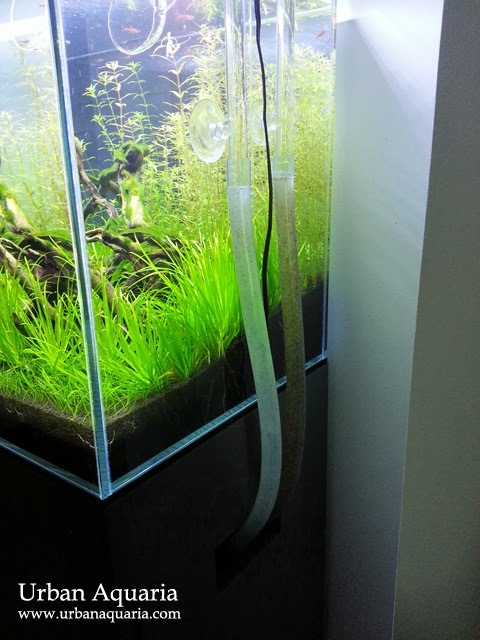 Its been 10 weeks since i started up my 64 Litre "Forest Edge" Tank and the tank glass and lily pipes are still relatively algae-free so far, seems like this setup is still maintaining a good balance in its parameters. The input hose has noticeably more algae than the output hose. 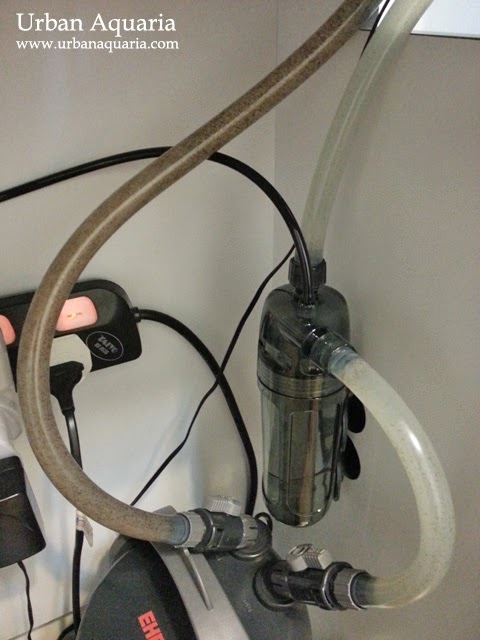 Initially i thought that it could be due to Co2-rich water flowing out from the inline reactor suppressing the algae growth, but when i checked the output hose inside the tank cabinet, i could see that the section of hose connected before the Co2 reactor also has noticeably less algae too. It seems that the water being drawn in through the input hose has excess nutrients to feed the algae, but after it is processed in the filter, the water coming out has less excess nutrients for algae, hence the distinct difference in algae growth between the 2 hoses. I've never seen this effect in my other tanks before. The only thing that i could think of that might have caused this phenomenon is the placement of a small 100ml bag of Seachem Purigen in the canister filter (this is the first time i'm using this product)... so it could be a direct result of the Purigen absorbing excess organics from the tank water. After some discussions and suggestions from fellow aquarists at the AquaticQuotient forum, the brown stuff in the hoses are likely bacteria colonies breaking down organic material or mulm (instead of algae), which also matches the current observations. Stumbled upon your blog from AQ. (Erctheanda here). the brown stuff in the inlet may not be algae. It could be bacteria colonies. As for the reason why its so obvious on the inlet and not the outlet is because through the media, the bacteria is filtered off by fine sponge as a last stage of filtration. I am a lazy hobbyist. for one of my tanks, i have a 2217 with no sponge. All media. The inlet and outlet pipes both have the brown/black stuff. slightly less on the outlet. Comparing this with the 2236, which has a fine sponge, the outlet has less black/brown stuff as the inlet. I do see the hoses turn brown over time in all my other canister filters, even though i use filter wool on all of them (i guess the outlets were also less dirty, but they were not so distinct)... this particular filter showed the most noticeable changes and the only difference in setup is i used Purigen, which likely cleaned the water so well that the differences were much more noticeable.